The University of California, Irvine, received FCC licensing to broadcast ZotRadio, a low-power AM traffic advisory and emergency radio, WQTB 222 operating on AM 1690, and audible from any location on campus. 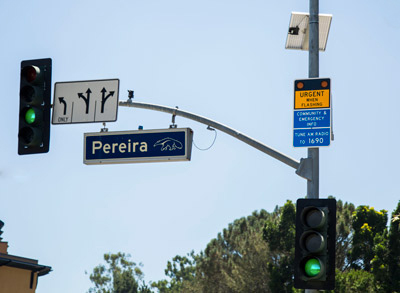 The UCI Police Department and Transportation and Distribution Services jointly administer the radio to broadcast traffic advisories and impacts related to events and public safety and emergency information to the UCI campus and local community. The radio system's primary function is to provide traffic conditions and alerts and emergency news and information should the campus experience a natural or manmade disaster or other emergency that would require quick dissemination of information and action by the campus community. Listen to 1690 AM for the most current traveler's information related to parking and transportation due to large campus events such as graduation and move-in or planned or unplanned roadway impacts. In the case of an emergency or Zotalert, the radio may broadcast information about evacuation instructions, shelter-in-place, or other directives related to the alert. The station broadcasts 24 hours a day, seven days a week. West Peltason Drive and Pereira. In an emergency, or when you see the yellow beacons flashing, tune your radio to AM 1690 or listen live online. Click here for existing ZotRadio scripts.